When it comes to measuring levels in vessels, guided wave radar (GWR) technology has many advantages, which includes having no moving parts to minimize maintenance costs. In a Process Worldwide article, How to Get the Best from GWR, Emerson’s Phil Lever provides some installation tips to help ensure accuracy and reliability. A low energy pulse of microwaves is sent down the probe that is reflected back when the pulse reaches the media surface. The transmitter measures the time taken for the pulse to reach the media surface and be reflected back with an on-board microprocessor that accurately calculates the distance to the media surface using ‘time-of-flight‘ principles. Each peak of the ‘echo curve’ corresponds to a reflection of the signal: The ‘Reference’ pulse is caused by the transition between transmitter head and probe. A further peak is caused by a reflection on the product surface. …a reflection of the radar signal (e.g. the surface of the level or interface, an obstacle, or something else). Phil notes that mechanical noise can pose issues. Other mechanical problems can include the proximity to metallic objects, such as the electrical grid inside a desalter vessel. Relocating the GWR, using a stilling well, or using the Trim Near Zone function may resolve these mechanical noise issues. The Near Zone is the region between 0 and 1 meter below the upper reference point. Trimming means that the measurement performance in the Near Zone is maintained even under these conditions and helps to prevent false echo indication. …a transient terminal block should be used where these conditions [such as lightning strikes] could occur. …it is important to ensure a ‘metal to metal’ connection between probe and tank. Also the size of the grounding wire is important for proper installation since it provides a direct path to earth. …important that an external ground wire is used in these applications. It is also important that the contents of a non-metallic tank are effectively grounded. If a tank is filled from the bottom, this can usually be achieved by grounding through the piping. 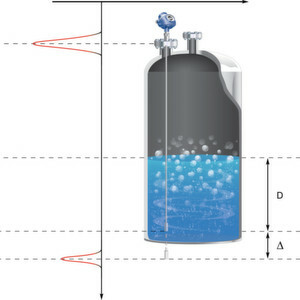 If the tank is filled from the top, the contents may not be properly grounded and it may be necessary to install a grounding rod covering the entire height of the tank. To achieve the best results and protect the GWR against damage, correct installation is important and dealing with the possible problems caused by noise is a vital aspect of the installation process. Providing the manufacturer’s recommendations are followed, correctly installed GWR level measurement devices will enable higher performance, lower maintenance and higher reliability. You can connect and interact with the level measurement subject matter experts in the Level track of the Emerson Exchange 365 community. Why Twin Lead and Single Lead in Guided Wave Radar Level Measurement? Posted Monday, December 2nd, 2013 under Level, Tank Gauging.